The aquamarine has been revered for its beauty and intensely blue colour, which is why it is named after the Latin words aqua, meaning water, and marina, which means the sea. But aquamarines do not always come in blue, and we at Kennedy Jewellers have taken advantage of this when using aquamarines in our designer jewellery to give our pieces a uniqueness that is unmatched. Celebrities such as Keira Knightly and quirky fashionista Lady Gaga both share birthdays this month, and both love jewellery designed to inspire, impress and make a statement. At Kennedy Jewellers in Coffs Harbour we have collaborated with prestigious designer Charlotte Lynggaard to make available one of the most beautiful and exclusive collections in Australia. Utilising beautiful aquamarine gemstones, we are able to refine and perfect each piece to ultimate beauty, with every jewel telling its own story. 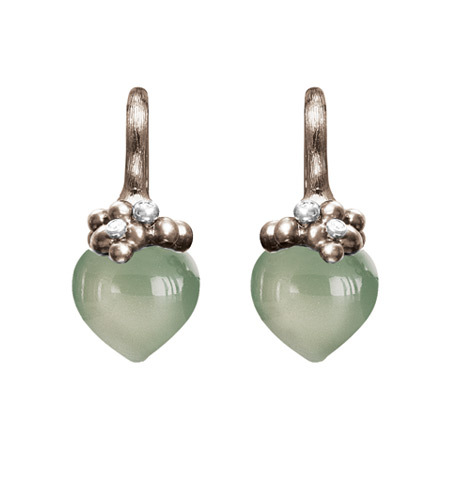 More than just a drop of beauty, these Dew Drop Green Aquamarine Cabochon Earrings feature 6 small diamonds in 18ct white gold will complement any skin type and add a touch of elegance to any ensemble. Reflect peace, calm and tranquillity with these delicate and beautiful earrings by Ole Lynggaard Copenhagen and available exclusively at Kennedy Jewellers. Release your inner goddess with these stunning Gypsy Chandelier Earrings that feature not only green aquamarine gemstones, but also rock crystal, milky quartz, blue topaz cabochon drops and 12 small diamonds set in 18ct yellow and rose gold branches, that beautifully drape the neck in delightful golden stems. The aquamarine was once believe to protect sailors and guarantee safety on long voyages, now it is said to help cool the temper and allow the person wearing the gemstone to remain level headed in tight situations. Give someone the perfect gift this month with gorgeous aquamarine jewellery, a gemstone that represents calm, peace and purity of the soul. 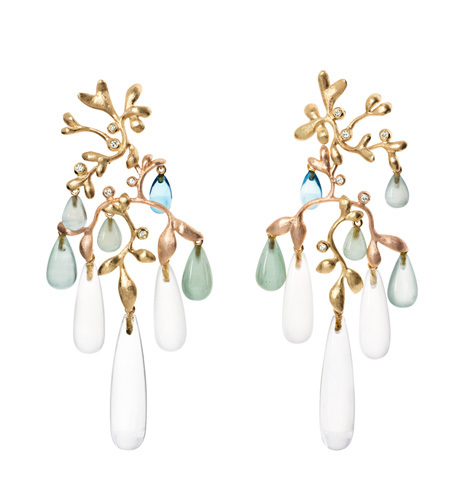 Aquamarines are perfect for evening wear as they can sparkle and gleam even in the most muted lighting. Compliment a low neck-line with our exquisite aquamarine earrings found only at Kennedy Jewellers. At Kennedy Jewellers we have a wide range or rare and exceptional quality gemstones that feature unusual cuts and organic treatments to permeate a colour that is as true as it was when it was unearthed. To discover more about aquamarines, or to book a design consultation at our Coffs Harbour showroom, please do not hesitate to contact us.